KANSAS CITY, Mo. (Reuters) - Archer Daniels Midland Co and other supporters of biofuels on Thursday said U.S. regulators grossly underestimated the amount of higher-ethanol fuel blends at pumps when requirements for next year's use of renewables were proposed. The comments came as oil companies, biofuels producers and farmers gathered at a Kansas City, Missouri, hearing to weigh in on the Environmental Protection Agency's (EPA) latest plan for the Renewable Fuel Standard (RFS), which requires the agency set annual targets for use of ethanol and other renewable fuels in gasoline. EPA has until Nov. 30 to finalize a proposal to require 18.8 billion gallons of biofuels - including 14.8 billion gallons for ethanol - next year to be blended with gasoline and diesel, above 2016 levels, but below targets set by Congress a decade ago. The RFS was designed to boost use of ethanol and other renewables in gasoline and diesel in a bid to reduce U.S. dependence on foreign oil and cut greenhouse gas emissions. Big Oil and Big Corn have been entrenched in a years-long battle over how much ethanol can be used in gasoline with existing infrastructure and vehicles. 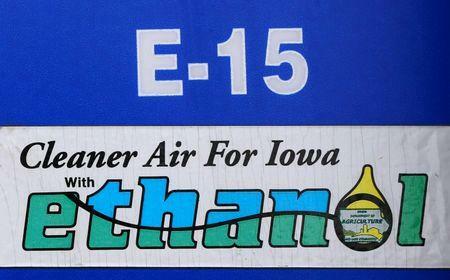 Oil companies have said it is not realistic to push ethanol use past about 10 percent of gasoline without an overhaul. Most gasoline in the United States consists of about 10 percent ethanol. There are over 600 stores setting up infrastructure for higher ethanol fuel blends, said Sean Miller, senior ethanol trader with ADM. High-volume stores, like Mapco and Sheetz, are putting in capacity to sell ethanol blends "reflective of higher" E15 volumes than EPA is estimating, Miller added. The U.S. government and others have funneled millions of dollars over the last year into funding equipment installation for the new blender pumps for E15 and E85, fuels consisting of 15 percent and up to 85 percent ethanol, respectively. Over 200 retailers sell E15 and another 3,400 sell E85, but some 2,200 stores are now installing equipment to sell those fuels, a representative from the Renewable Fuels Association said on the sidelines of the hearing. That would mean exponential growth in the availability of the fuel as cars are changing as well. But that remains a relatively small portion of some 150,000 gas stations nationwide. Oil group American Petroleum Institute said Thursday that its primary concern remains the "blendwall." This is helping lift costs to meet the requirements for oil companies like Valero Corp, HollyFrontier Corp and CVR Refining.